Clear differences are emerging between the U.S. and South Korea in their approaches to North Korean denuclearization. The Trump administration, sulking after the North Korea-U.S. summit in Hanoi last month collapsed, now insists on full denuclearization again, but Seoul would be content with a "good enough" deal. Cheong Wa Dae believes the "complete, verifiable and irreversible denuclearization" the U.S. seeks is a pipe dream. It hopes that Washington and Pyongyang can agree on a comprehensive roadmap before embarking on a phased approach, whereby North Korea is rewarded with the easing of sanctions at each stage. A high-ranking Cheong Wa Dae official said Sunday, "We need to go beyond this inertial framework of negotiations with North Korea and rethink the 'all-or-nothing' strategy" of the U.S. He said the new approach should be to "negotiate a comprehensive framework for denuclearization and turn small deals into 'good enough ones.'" The phased approach is exactly what North Korea has been insisting on, which caused U.S. President Donald Trump to walk out of the summit. 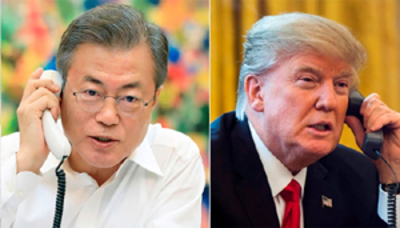 A diplomatic source in Seoul said Monday, "There are conflicting views within the U.S. government about the possibility of a comprehensive deal, but the South Korean government is publicly toeing a different line that hurts its credibility."